The VFP (Valentine, Friday and Pay Day) traffic stopped me from shooting my first choice for this week's photo challenge. I waited for that elusive UP-Pantranco jeepney but the line of passengers just kept on getting longer. I didn't only miss the chance to shoot my favorite spot in UP Diliman, I also missed this year's One Billion Rising Philippines, a global street dance for justice and women's rights. When I finally decided to abandon my UP Diliman gig, I had to think of a familiar place to shoot and it must be accessible from the MRT stations. The last condition must be met because I had no choice but to take the train to escape from the horrible VFP-day traffic. The moment I set foot on the train station's platform, I already knew where to go. 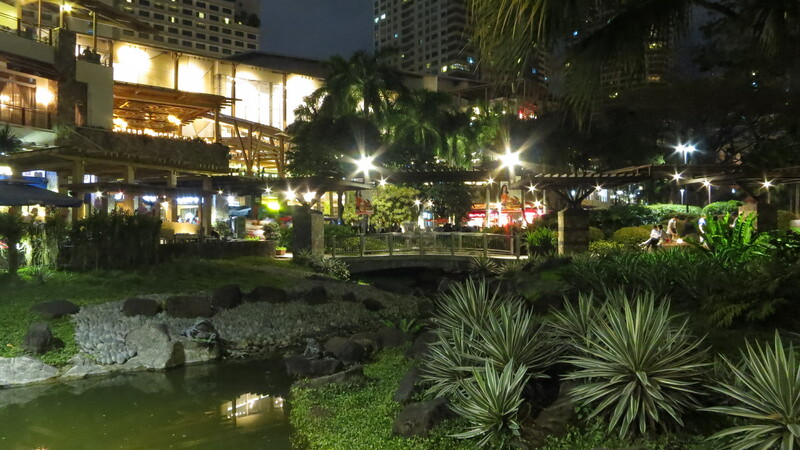 Where else, but to our family's official tambayan : Greenbelt in Makati! I took this photo using our point and shoot camera. I had to deal with very limited lighting. In the absence of a tripod, I was able to shoot in long exposure mode by placing the camera on the railings as steady as possible. Shooting at night without a tripod can be really frustrating. Almost all the shots I've taken were either too grainy ( caused by high ISO) or blurred because of my very unreliable and shaky hands. Thanks to my ever supportive husband who stayed with me as I struggled to get a good shot. Lastly, thanks to this blog challenge,this photoshoot turned out to be our Valentine's date too. Que horror nga ang traffic kahapon at ang sardinas peg sa MRT! I'm just glad I was able to submit my 2nd photo at may bonus pang VDay date! I also shot my week2 photo with a point and shoot, with minimal lighting. So hello, grainy photo! The traffic inside Alabang alone was horrible already, so I can imagine what it was like outside. Super yikes. That's why we chose to stay home instead. Just dropped by your blog MrsC. May wish ako sa door ninyo. Congrats we made it to week2! Yey! Congratulations for braving the traffic last Friday! I hardly see Greenbelt at Night, it's so pretty! Nice shot! Love the starburst effects on the lights! So pretty! :D Really gave the place a (literal) pretty sparkle.